The TP53 Trust was established by the family of George Pantziarka, who suffered from Li Fraumeni Syndrome (LFS), and who died in on 25th April 2011 after suffering from his third cancer. It was only after George had been diagnosed with his third cancer that he was gene tested and found to a mutated TP53 tumour suppressor gene. 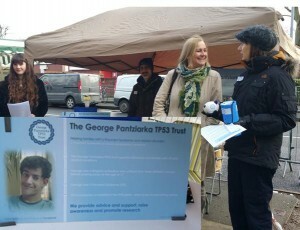 The George Pantziarka TP53 Trust is the UK’s only charity dedicated to supporting individuals and families suffering from LFS or related conditions (such as Li Fraumeni-like Syndrome). Our aim is to provide practical advice and support, create a sense of community among affected families and to promote research of benefit to people suffering from these conditions. You can read more of George’s story here. To find out more about the condition please look at our collection of FAQs and leaflets. Please get involved – join the Forum, join in a conversation with our bloggers or contact us via email.